Adobe Creative Suite (CS) is a software suite of graphic design, video editing, and web development applications developed by Adobe Systems. Each edition consists several Adobe applications, e.g., Photoshop, Acrobat, InDesign, Premiere Pro or After Effects. The last version, Adobe Creative Suite 6 (CS6), was launched at a release event on April 23, 2012, and released on May 7, 2012. On May 6, 2013 Adobe announced that CS6 would be the last version of the Creative Suite, and that future versions of their creative software would only be available via their Adobe Creative Cloud subscription service. Adobe also announced that it would continue to support CS6 and would provide bug fixes and security updates as necessary. 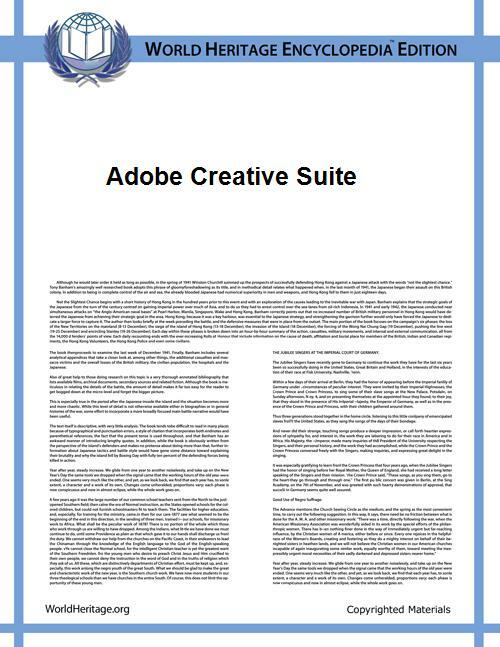 The Creative Suite packages were pulled from Adobe's online store, but still remain available via a section of their website. The following is a brief descriptions of the core applications in the various Adobe Creative Suite editions. Each edition may come with all or subset of these apps. Adobe Acrobat creates, edits and manages documents Portable Document Format (PDF). digital asset management app. It features limited integration with other Adobe apps but has no editing capabilities of its own. Adobe Fireworks is a raster graphics editor for web designers. It can create interactive contents (e.g. buttons that change shape when the mouse cursor is hovered on) and animations. Adobe Flash Professional, a multimedia authoring program used to create web apps, flash games, films and mobile widgets in the eponymous Adobe Flash format. Its features include a scripting language called ActionScript and bi-directional streaming of digital audio and video. Adobe Flash Builder, formerly Adobe Flex Builder, is an integrated development environment (IDE) built on the Eclipse platform meant for developing rich Internet applications (RIAs) and cross-platform desktop applications in the Adobe Flash format. Adobe Soundbooth is digital audio editor. It has less capabilities than its sibling, Adobe Audition. Applications in the Creative Suite family were capable of accessing a stock photography service called Adobe Stock Photos before the service was discontinued in 2008. In 2015, Adobe once again launched a stock photography service called Adobe Stock along with its Creative Cloud service. Customers must pay a subscription fee and if they stop paying, they will lose access to the software proprietary file formats, which is not backward-compatible with the Creative Suite (Adobe admitted that this is a valid concern). Individual subscribers must have an Internet connection to download the software and to use the 2 GB of provided storage space (or the additionally purchased 20 GB), and must validate the license monthly. In addition to many of the products formerly part of the Creative Suite (one product, Fireworks, was announced as having reached the end of its development cycle), Creative Cloud also offers subscription-exclusive products such as Adobe Muse and the Adobe Edge family, Web-based file and website hosting, Typekit fonts, and access to the Behance social media platform. The new CC versions of their applications, and the full launch of the updated Creative Cloud service, was announced for June 17, 2013. New versions with major feature updates have been released regularly, with a refresh of the file formats occurring in October 2014. Adobe also announced that it would continue to offer bug fixes for the CS6 products so that they will continue to run on the next versions of Microsoft Windows and Apple OS X. ^ a b Crosby, Connor (2012-04-23). "Adobe Announces CS6, Ships May 7th?". EditingWhiz. Retrieved 2013-02-03. ^ Cunningham, Andrew. "Adobe’s Creative Suite is dead, long live the Creative Cloud". Ars Technica. ^ "Creative Cloud now includes Creative Suite Master Collection and Design Premium features". Adobe. 2013-05-07. Retrieved 2013-05-26. ^ Nack, John (4 February 2008). "Adobe Stock Photos to be discontinued". John Nack on Adobe. ^ Bookwalter, J.R. (16 June 2015). "Adobe updates Creative Cloud with a sync service, stock photos, and more". ^ Wadhwani, David (19 June 2015). "Adobe Stock: Shaking Up The Stock Content Market". Adobe Creative Cloud blog. ^ "New Adobe Acrobat 8 Professional Enhances Adobe Creative Suite 2.3". ^ "CS2 Downloads". Adobe. Retrieved 2013-02-03. ^ "Support for Intel-based Mac computers" (PDF). Adobe. 2006-01-31. Archived (PDF) from the original on October 29, 2006. Retrieved 2006-09-29. ^ Borg, Johan (2007-03-28). "9.2 Beta – By Opera Desktop Team". ^ "Press Room: For immediate release". Adobe. 2009-07-14. Retrieved 2010-04-04. ^ "Q2 Fiscal Year 2011 Earnings Call Script" (PDF). Investor relations. Adobe. Retrieved 2011-10-02. ^ Open Letter to Adobe about the Creative Cloud Subscription Model, . ^ "Creative Cloud Complaints Darken Adobe’s View of the Future", TidBITS . ^ "Analysis: The real reason Adobe ditched Creative Suite for Creative Cloud", DigitalArts (UK) . ^ "Build Your Own Adobe Creative Suite with Free and Cheap Software", Life hacker . ^ "Bring out the GIMP: Adobe Photoshop and Creative Suite to become subscription-only", ExtremeTech . ^ Gerard (2013-03-26), Subscription or Perpetual Box / Download – It’s Your Choice ( . ^ "Corel woos customers unhappy with Adobe’s subscription-only Creative Cloud plan", Imaging Resource, 2013-05-20 . ^ a b "Max 2013: What's New with Adobe CC Design Products". Mac life. Retrieved 2013-05-26.